Miguel Guía was born in Madrid on October 29, 1960. Since early life spending his time at the company of artistic reproductions founded by his father, Miguel grew up surrounded by art, observing work and modeling by many sculptors and in variety of styles, such as: classics, impressionists, constructivists, etc., learning along the way all the modeling techniques, materials and molds. Immersed in a family environment Miguel begun and continues to model, paint, design and causes everything to come together to develop a creative spirit and a special sensitivity for beauty in all forms of expression. We can see in the works of Miguel Guía several stages of his always integrated evolution, in which continuity is not lost, where no previous achievements are discarded, instead, remain and continue to bear fruit in parallel with the development of new forms of expression. His permanent restlessness and creativity, fed by the current means and techniques of information that permanently turn over the artist with a true tsunami of inspiration, stimuli, ideas and new technical possibilities of design and execution, is reflected in the most recent era of Miguel Guía. All at the current moment, in full maturity, in the materialization of complex work and difficult to the condition by a specific epigraph. 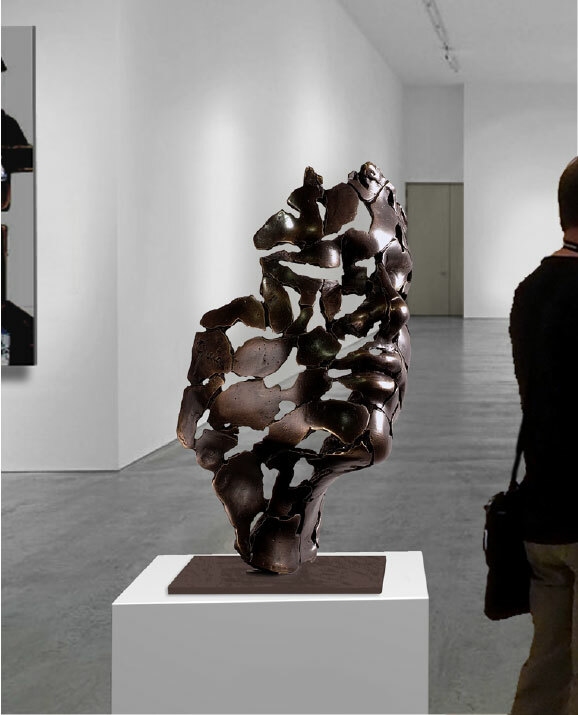 We can see how he defines shapes, stamped and marked forever, his works become fluid, as Zygmunt Bauman would say, and released to manifest themselves in a multitude of languages and expressive ways that only Miguel knows how to use to the creative fullness in order to achieve the goal of all art: Incessant search for Beauty. Already,y in his sculptoric maturity, Miguel surprises us with the work “The Essence of Youth,” the first series of the opera, which he will later name as the Essences Series. In it, Miguel uses an expressive language starting from the formal reality he subtracts elements and creates spaces that invite the viewer to feel the emotion of participating and being integrated into the creative process. Miguel proposes to us to feel the magic of following him from that initial singularity that contains the whole in front of the void. Then guides us through the emergence of matter and the form that he projects open to change and permanent transformation, all the while not allowing the dynamic impulse in a determined and closed composition to deteriorate and keeping the initial inspirational breath alive. 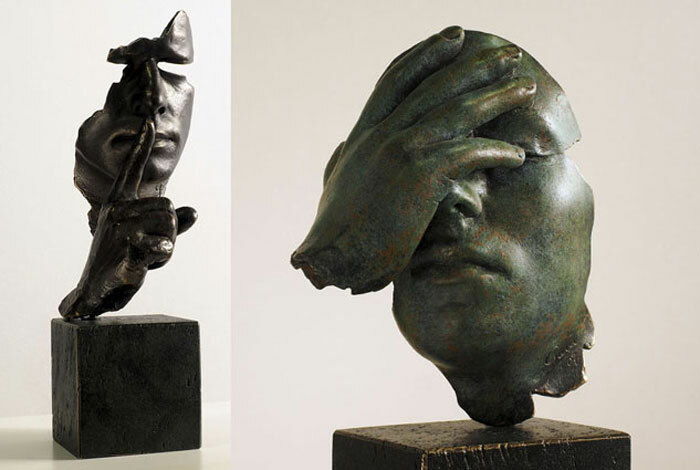 It was not until 1990 when he approached his first stage as a realist sculptor with ” The Calm and Silence” and “The Reflection.” Thay is also his first two steps in the Realism Series, with which Miguel starts to take on a reversed path to his previous stage. What was previously proposed as a projection towards the spectator, dynamic and expansive, now becomes introspective, intimate, directed at the world of reflection and having a contracted and serene form. Both the Magical figuration and realism create a dialogue in the creative process of Miguel, so heavily influenced by his admiration for Antonio López, they form a thesis and antithesis which will be constant in the successive stages. Alternating and sometimes overlapping in time without one prevailing definitively over the other. 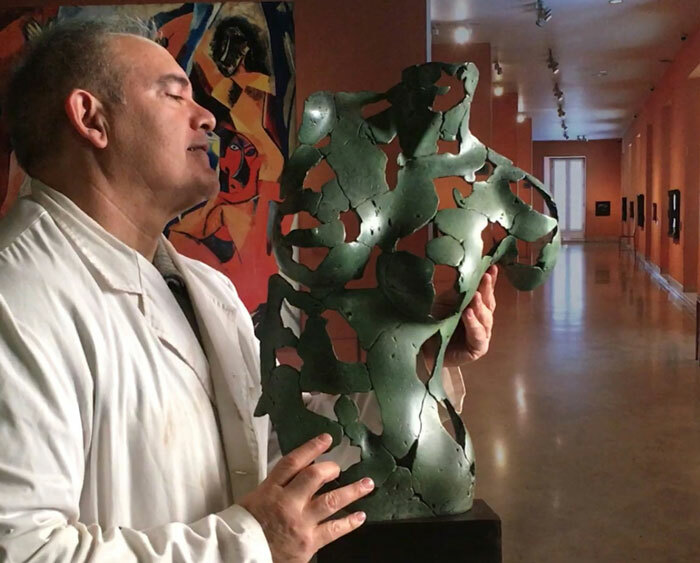 His first steps as a sculptor were cubist, inspired by Gargallo, Lipchitz, and Archipenko. They were the avant-garde of cubism in sculpture. 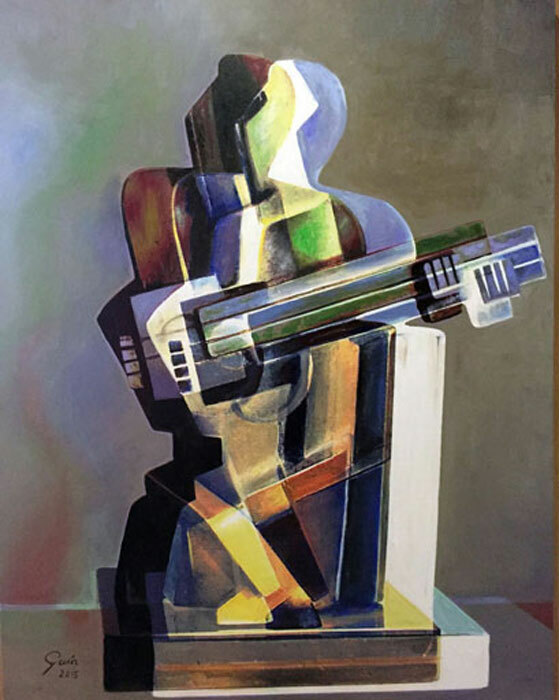 At the same time in his works we can notice the strong influence exerted by Juan Gris and Pablo Picasso, more specifically out of the graphics work in that form of expression, which moves him to create an outstanding series of works in which he deals and manages to respond to the challenge of creating a cubist abstraction. Among his works in that style stand out the Harmony of Samothrace, the Cubist Horse of Guernica, the Harlequin and the Menina. In painting he navigates in three directions: Cubism, Realism and Impressionist. Although he began his cubism exploration with a sculpture, he soon, after seeing an exhibition of Juan Gris at the Reina Sofia Museum in Madrid, became interested in the pictorial aspect of cubism. 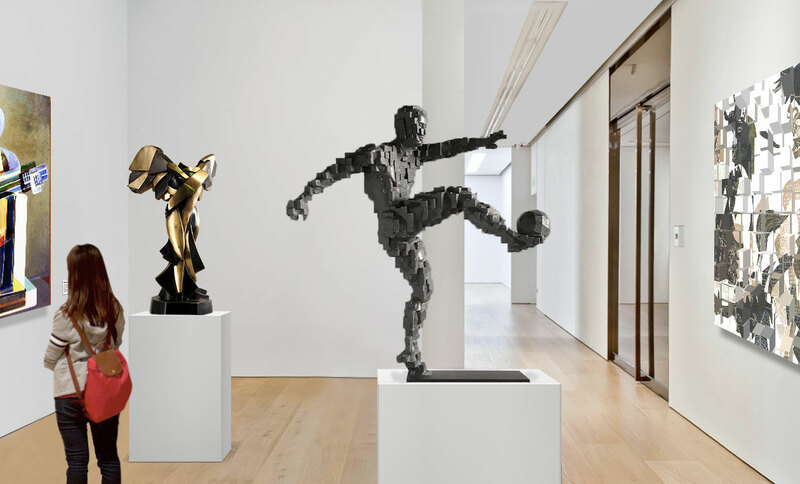 He began to painting creating his own style, a three-dimensional cubism, based on his sculptures; he decomposes the cubist planes giving them more dimensions in the eyes of the viewer, creating a very special space. His first work “Three-dimensional cubist harlequin” manifests perfectly what the artist wants to show us. This artist has always liked realism and in painting he, specifically, seeks to reach the viewer not only by an actual reproduction of an idea, but to cross through the gaze of the observer and make them excited by the painting. 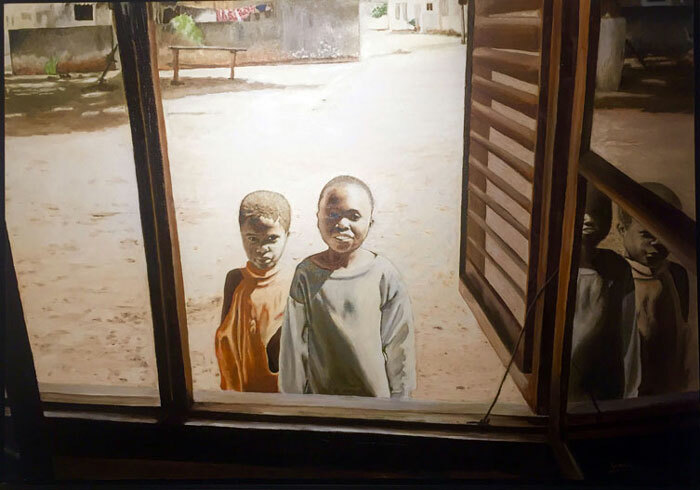 As a very good example, thereof, may serve one of his first paintings “Leaning into Africa” where the artist transmits to the observer who, through the window, looks out over the African continent, its light and its people and, in turn, the children from there appear to be looking through the same window into our world. Within Miguel Guía’s artistic versatility, he navigates through a very particular impressionist style, although his other styles, especially realism, are also recognizable within his works. His impressionism does not stop being a reality that does not depend so much on the literality of the trace but the effect of light and shapes on our retina and to this end Miguel uses the color with the force necessary for his paintings to reflect that other reality. 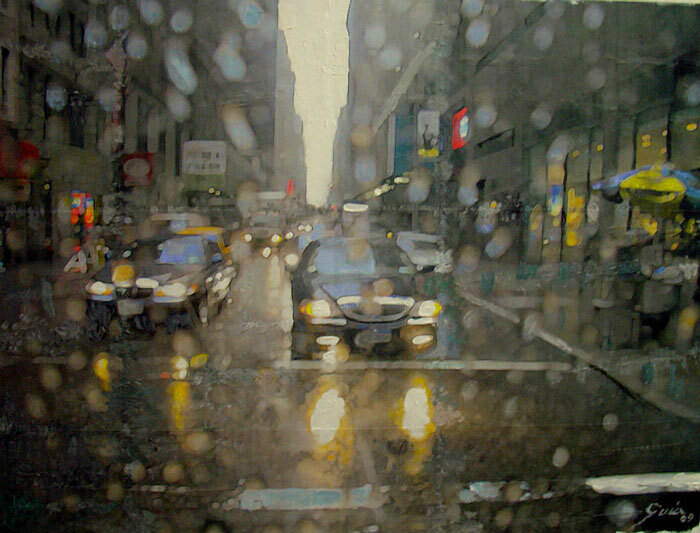 His first painting “Raining in New York” is a clear example of how the author achieves a very cinematic and visual effect with light and color.